When I just came back for good last year to Jakarta, one of the things that I miss most is the convenience of getting around the city by public transport. Yap, I agree that there are many options of transportation available in Jakarta – taxis, TransJakarta, other big buses and also smaller vehicles like Mikrolet that connecting one place to another at smaller roads around Jakarta. Plus, online taxis which are just a call or a click away using our smart phone and they will be right where we are waiting at as soon as they can. While so many options available that seems to give us convenience to move around in Jakarta, BUT, if we rethink again, do those facilities really do what we think they do? They may be an answer to our convenience matter to some extent, however, we shall not forgetting that at the same time, the other issue that come along with it, is still remain the same. Or maybe even worse? You know what I am saying, do you? An issue that Jakarta already has for a long time – traffic jam. Obviously, it is caused by the number of vehicles that grow much faster than the growth of the road capacity in Jakarta itself. As an ordinary people who don’t always watch statistic closely regards to that matter, I can only refer to the study done by SITRAMP and respective department in the capital in year 2004. It says that if the current situation remains the same, no actions being done to solve the issue, then we all shall expect a TOTAL traffic jam happening in Jakarta in year 2020! Meaning, take a few steps out from our house and we will already be caught in the jam! Besides that, more vehicles means more pollution and we won’t be surprised to know that 80% pollution problem in Jakarta comes from…yeap, the vehicles. Fortunately, Indonesia government don’t stop working right there. We are going to have an MRT soon! A train that connects one end to the other end of Jakarta that moves fast and jam-free. Expected it will help to improve traffic in Jakarta and it will be officially operating in March 2019. 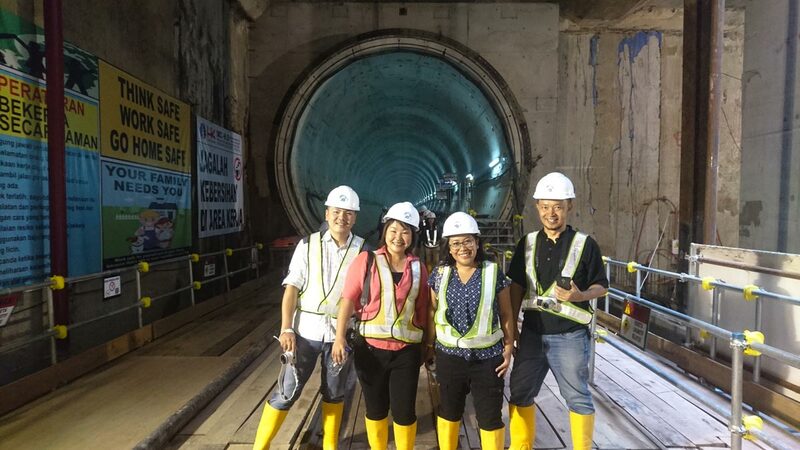 Few days ago, me and my friends had a privilege to do on-site visitation at one of the MRT Jakarta (MRTJ) station– Bundaran HI in the central of Jakarta. We were there in the morning as the visitation was scheduled from 9 am to 12 noon the latest. We received updates about the project verbally and visually through the slides presentation at MRTJ office before heading to the site. It was interesting to know how the project goes, what the big plan and expectation by having this MRTJ. Some facts about traffic condition in Jakarta that I don’t know before and how serious the condition that we are currently facing. Arh, don’t worry! MRTJ is on the way! On-site group briefing. We changed our shoes and wore safety helmet as per instruction. After briefing, we were led to the staircase down to the underground station. It was about 18 m deep in total from the road surface to the train platform. While I was walking through each section of the station, I was trying to imagine the finished look of the station based on the visuals shown earlier during the presentation. Phew, somehow my imagination level went down to the valley at that point. We were busy taking photos to capture every possibly seen corner before it is completed. Yeah, that ‘before’ and ‘after’ photos. It will be a precious memory for us once it has been fully built. Not long after, from a far, we could see what most of us looking forward for – the tunnel! There are two tunnels that put us assured that the trains won’t be hitting each other from opposite direction. If you keep on reading, you will see the close-up photo of the tunnel. The tunnel is built up from pre-made solid parts that been arranged that way to form a circle. One circle consist of six pieces – five big parts and one smaller part as the lock to secure everything as one piece. That indefinite circulars along the tunnel somehow looks like a wormhole that lead us to the other side of the world. Arh..just my imagination. But seriously, can’t you imagine that? Spread the words! Jakarta will have MRT soon! When I was still staying in Singapore, I took MRT everyday to almost everywhere I go. At least it got me to the nearest point where I could then continue by walking or taking bus or taxi to the places I wanted to go. Faster, no-hassle and definitely more economic. And the best part, we can estimate how long the journey takes. The intervals are consistent and accurate most of the time. Although during peak hours, the crowds is still unavoidable. But hey, it happens everywhere. While thinking of those taking MRT days, I look around the tunnel and my friends that standing on the MRT tracks for photos, I myself can’t deny that I have high expectation about this MRTJ. Especially, knowing that we actually already had the idea of making MRT as one of the transportations in Jakarta long time ago – about the same time as Singapore did, it shouldn’t be delayed any further, I think. To stay updated about the progress of MRT Jakarta, do follow their Instagram, Facebook, or Twitter! How is the traffic condition in your city? Is there any MRT or similar transportation in your city? Share how do you usually get around in your city in the comments.